After Wednesday’s Apple media event, we got to spend a little while in a hands-on area adjacent to the Yerba Buena theater with a few dozen members of the media, analysts, VIPs, and—most importantly—new iPods and Apple TVs. Without any further ado, here’s what we spotted. If you ask us, the second-generation shuffle—the tiny rectangle with circular buttons on its face and a built-in clip—was the pinnacle of iPod shuffle design. The third-generation model, which dropped buttons and forced you control it from a set of headphones, was a step back. Apparently lots of Apple’s customers felt that way, too, because Apple has done a rare pivot and gone back in time for the design of the fourth-generation shuffle. It’s got the snazzy voiceover features and playlist support of the third-generation model, but it’s got that familiar set of buttons on the face. Though the new shuffle will feel familiar for anyone who’s used one of the older models, there are differences—but they’re minor. It’s a little bit smaller than the second-generation model, and there’s a new VoiceOver button that triggers the shuffle’s voice-navigated interface. Bottom line: it feels like the old shuffle, but a tad smaller, and with buttons, glorious buttons. 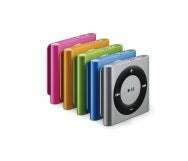 During its many lives, the iPod nano’s design has been all over the place. It was super tall, then it was fat, then it was thin with a bigger screen. Late in the game Apple threw in a video camera, just for kicks. This new nano is unlike any that have come before. In fact, the best way to describe it is like a larger iPod shuffle, but with a touchscreen. It even comes with an integrated clip, so you can stick it just about anywhere. While it’s unclear what operating system is actually driving the new nano, that’s a geeky question that loses sight of the most important point: The new nano’s touchscreen interface will be instantly recognizable to anyone who has ever used an iOS device. The device’s home screen is no longer a set of menu options, but a set of icons with labels underneath them that you tap on, just like iPhone apps. You swipe your finger from right to left to page through a series of screens. I was able to pick a nano up and start using it immediately, with very little learning curve. You can tap and hold your finger to go back to the home screen, or just keep swiping back through menus until you reach the top. Scrolling through lists and tapping on options is a natural, iPhone-like experience. When a song is playing, the screen displays cover art, and you can tap to reveal play/pause controls. There are dedicated volume buttons on the side. Unlike the iPhone and iPod touch, the iPod nano doesn’t use its accelerometer to determine orientation. That’s a good thing—you can clip the device in any orientation you want, and then use two fingers to “spin” the iPod’s interface so that it’s displaying face-up for you. No, this iPod nano isn’t like an iPhone, with downloadable apps and the like. And it’s utterly lost the ability to record or even display video—”nano does video” no more. You can display photos on the tiny 1.5-inch touchscreen, and they look nice, but they are most definitely small. One last detail: Unlike the iPod shuffle, which requires a special cable that plugs into its headphone jack in order to to sync with a Mac, this tiny nano still has a full-sized iPhone dock connector port. The new iPod touch is, internally, very close to being an iPhone 4. It’s got the same Retina display, and it’s got forward and backward facing cameras (though the rear camera shoots at 960 by 720 resolution, much less than the iPhone 4’s) and support for FaceTime video chat. But it’s got some clear physical differences, too, most notably its thinness. The last generation of iPod touch was already thin, but it’s even thinner now, and quite light. The screen looks great. There’s a new FaceTime app, which you use to initiate FaceTime calls. (To answer the question, how does a device that’s not a phone receive FaceTime calls: It does it via e-mail address. You enter e-mail addresses in the FaceTime settings, and then people can call you and you can call them via the FaceTime app or the Contacts app.) And yes, there’s a microphone on this iPod touch so you don’t have to put on headphones to use FaceTime: It’s located on the bottom edge of the device. Beyond that, I’m not sure what we can say about the iPod touch. It’s the thin, small iPod touch we’ve come to expect, but loaded with many (though not all) of the iPhone 4’s features. If you were drooling over the Retina display but didn’t want to buy an iPhone 4, now you don’t have to. 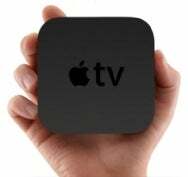 The Apple TV was released four years ago, and even with an updated interface, added features, and price cuts, it was never what we’d call a success. Part of that can be attributed to the fact that Apple considered it a ‘hobby’ and never really devoted the time or resources to make it a better product, but as Steve Jobs admitted during today’s event, it also didn’t give customers what they wanted. This new Apple TV certainly wins on the hardware front: On the outside, it’s a quarter the size of the original, a tiny black box that will likely run cool and quiet due to its utter lack of a hard drive. You can pick it up and hold it in the palm of your hand, easily. On the back is a small selection of ports, far fewer than on the previous model. If you don’t have a TV that supports HDMI, forget it—this device has only an HDMI port for video out. There’s also an optical-audio port, an ethernet jack (along with built-in 802.11n networking), and a USB port that Apple says is for support use only and not for any end-user functions. On the inside, the specs have been updated to support 720p video at 30 frames per second (the previous model could only hack 24fps, and even then there were often issues). This is a big deal because a lot of TV-show content is shot at 30 frames per second, and Apple wants everything on the new Apple TV to be in HD, including TV rentals (although Apple does appear to plan on offering SD TV show rentals—presumably for any content not available in HD—for the same 99-cent-an-episode price). And the price drop to $99 might be low enough to entice the curious who would never have dropped $200-plus on such a device.